When everything you eat causes pain, this STRICT DIET PLAN is exactly right for you. 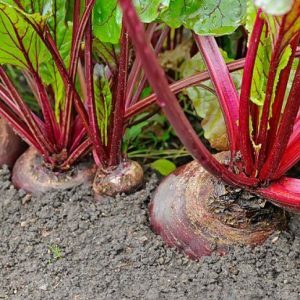 If you have gallbladder pain from a low-functioning gallbladder or gallstones, and especially just following a gallbladder attack, you need to drink only helpful liquids and introduce gallbladder-friendly foods slowly. This is designed for you if you have pain with everything you eat OR you are afraid to eat – so you eat nothing and then when you do eat, you eat the wrong thing. If this does not describe you, this is not the diet for you. It is a minimalist diet plan, slowly working up to a moderate plan which is Phase 2. 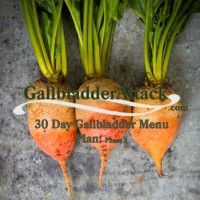 Gallbladder Menu 2 will contain a larger variety of foods with more recipes and should be used with symptoms of discomfort and perhaps pain with only a few particular foods. The introduction includes the main principals of a gallbladder diet and what supplements to start and at what point in your program to do so. The menu plan tells you what to drink, what to eat and at what times, beginning with rising and ending with a bedtime snack. There are recipes to accompany each entry. The recipes are not gourmet. Let’s face it; there are very few foods allowed in the beginning. So basically, you are getting several variations on the same foods. When you can eat little variety, even slicing something differently can make a change in the palate. This is what we have been asked for, so here it is. Note: I highly recommend that you purchase The Gallbladder Starter Kit. You need the concentrated action of the products to support healthy bile and to support the gallbladder, liver and overall digestion. Most people who try to work with the diet alone eventually come back to order the products sooner or later. So don’t waste your time: work with both now for quicker results. Just as you don’t get the best results with products alone and ignoring diet, if you follow a diet without the products you also do not get optimal results.